I have had the opportunity of being engaged in consultative meetings regarding Nairobi Integrated Urban Master Plan (NIUPLAN) which my parents never did in 1973, this is was the last plan for Nairobi. The 1973 – 2000 master plan was developed and one of the most important issues I have noted was recognition of the urban poor, investment in provision of housing by the council and well equipped city with accessible social amenities like playing grounds and social halls. In the meetings I have attend, lack of space and high population have been attributed to the break down in provision of services. Listening to various presenters, one easily concludes that the city has been running without master plan for 14 years while urban planning department never had experts and qualified staff to enforce some of the recommendations in the 1970 Nairobi Master Plan. During the 14 years period, Nairobi City went to the dogs. Parking spaces in some city estates were grabbed, sprawling of slums along major Nairobi river become coupled with forceful evictions, the once safe and City in the Sun paradise became Nairobbery. Slums are not an issues. The current Nairobi master plan assumes that slums will just disappear. Listening to concerns of residents from Marurui, Thome, Kasarani and Mathare issues such as controlled development are never adhered to. In some residential areas such as Huruma, Kayole and Pangani it is common to find buildings with more than six storey without lifts. Poor road net has greatly contributed to uncollected garbage lying in low income neighbourhoods with garbage collectors’ lorry unable to access inside these place hence continued accumulations on solid waste. The Nairobi Master plan is a good to start in the right direction. It is five minutes past mid night or let us just call it 18t January very early in the morning and were all gathered in small video room which we have paid Ksh. 25/- to witnessed the greatest club match on on earth between Barcelona FC and Real Madrid at ‘Wembley’ video hall. Today the fee has been hiked from Ksh. 20/- to Kshs. 25 since it is a special match. The video has about 150 people crammed in ready to watch the big match. If you are an outsider you will be lying to yourself that people are there to watch the two teams or support José Mourinho or Pep Guardiola. Here it is all about Messi and Ronald. There are more people supporting English Clubs than individual players. Even Mathare United a soccer club in Kenya Premier League and which is being coached by Gabrial Njoroge who happens to be from Mathare Kosovo would not be able to attract this kind of support unless Ronaldo or Messi becomes the coach. As the match is started people will arguing about the two players. From exchanges one realizes how people are informed about soccer and these tow players. One of the argument I picked who is rich between the two since it nearly generated into ‘war’. Who is rich among them? ” a guy shouts from Ronaldo’s corners and shouts its Ronaldo…now way Messi supporters interjects that it Messi. Another young comes with his Nokia C3 models and says that Ronaldo appears on the list of richest sportmen ahead of Messi…to prove his point, he googles and show us Forbes list showing. http://www.forbes.com/sites/kurtbadenhausen/2011/04/20/the-worlds-highest-paid-soccer-players/. Never mind this a 2010 list. A few Messi supporters come forward to look and confirm but some are convinced but majority no…11th minute of the game Ronald scores and the hall erupts into wild celebration. All this is happening a few minutes past mid night. To Ronaldo’s supporters the match is over and there are constant calls by Ronaldo’s supporters for the match to be ended. I wish both Ronaldo and Messi could this live too. I am sure they would love it more than playing back in Spain. It is mid morning and six young girls are being taught how to speak German. The class has been going for the last two months. From the look of things, Mr. Abubakari Ndeti has really done a good job as a teacher. 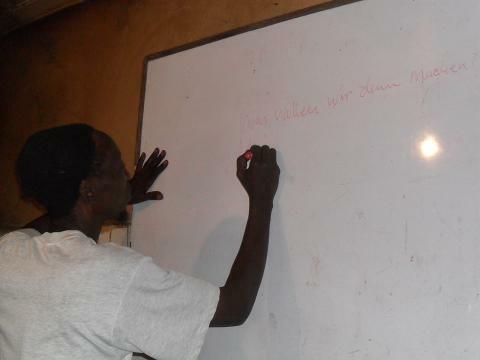 Every morning at 9.30 am he teaches German language for free at Ongoza Njia Community Development Centre. 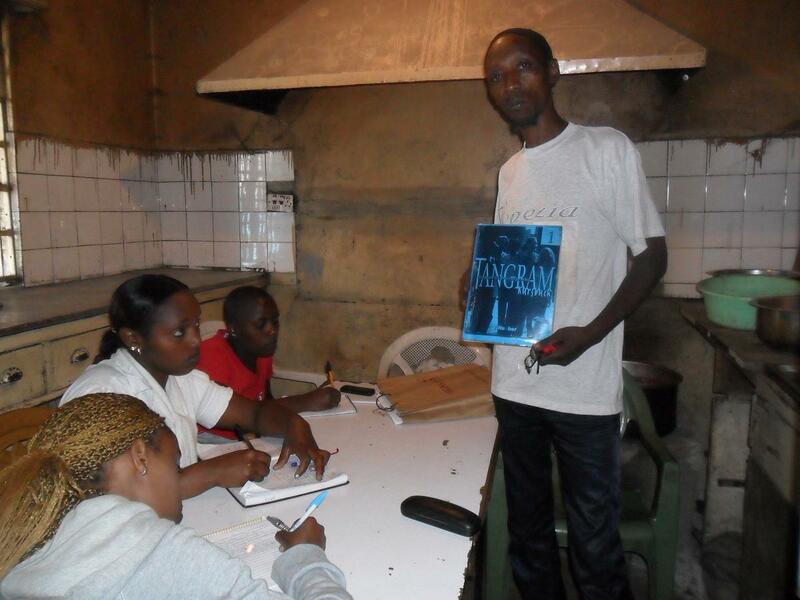 The centre was started with funding from the French Embassy in Nairobi. The aim of the centre is to mobilize local resources through partnership with member associations in Mathare and Huruma to social injustices. Mr. ABubakari has been speaking fluent German for the last 10 years a skill he acquired from a German friend he met through arts and cultural programme. He has always felt guilty that he is not doing anything to help his community. Teaching German and speaking German gives him a lot of joy. Apart from German, he can speak Kiswahili, English, Kamba and Kikuyi fluently. When we met at the centre he expressed a desire to be included in the community project as a volunteer and German teacher. He has a desire to mobilize all kinds of resources that are not being utilized due to lack of employment in slums to improve the community way of life. He asks ‘why deny others your skills and you are not using it for development?’ The current number of student is 15 but sometimes only five attend.